Info "Tilt the room and slide the milk over! Don't spill it, you klutz!" Mooo-ve It! is one of Dr. Crygor's microgames in WarioWare: Twisted! The theme of this microgame (person, color etc.) is very similar to the microgames Crazy Straw, and Cup Runneth Over from WarioWare: Touched! 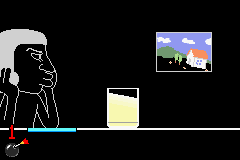 The game's purpose is to slide over the glass of milk and stop it when it reaches the man's hand. If the man catches it, the game is won. However, if it spills or gets past the man, the player loses the game. 1st level difficulty: The glass is thick. 2nd level difficulty: The glass is thinner. 3rd level difficulty: The glass is very thin. This page was last edited on September 27, 2018, at 18:56.